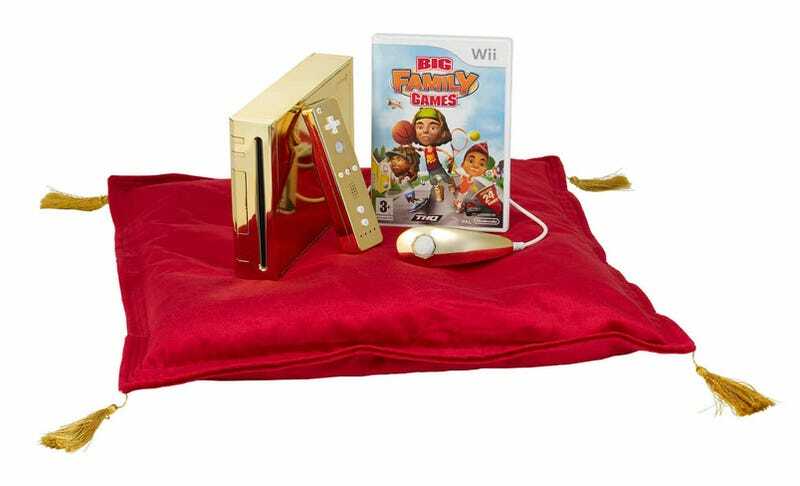 THQ knows that if you're going to deliver a Wii to Buckingham Palace to promote your new game no ordinary console will do, so they had one gold plated. The shiny Nintendo console was delivered to Buckingham Palace today as part of a marketing stunt meant to promote BIG Family Games, the latest title in THQ's BIG series. The game contains 24 classic family games, from lawn darts to bocce, which THQ product manager Danielle Robinson hopes the Royal Family will enjoy. Of course chances of Her Royal Highness ever touching the console, let alone playing it are somewhere between slim and none, even if she has shown interest in the console in the past. Maybe they'll trade it with President Obama the next time he shows up with iPods.